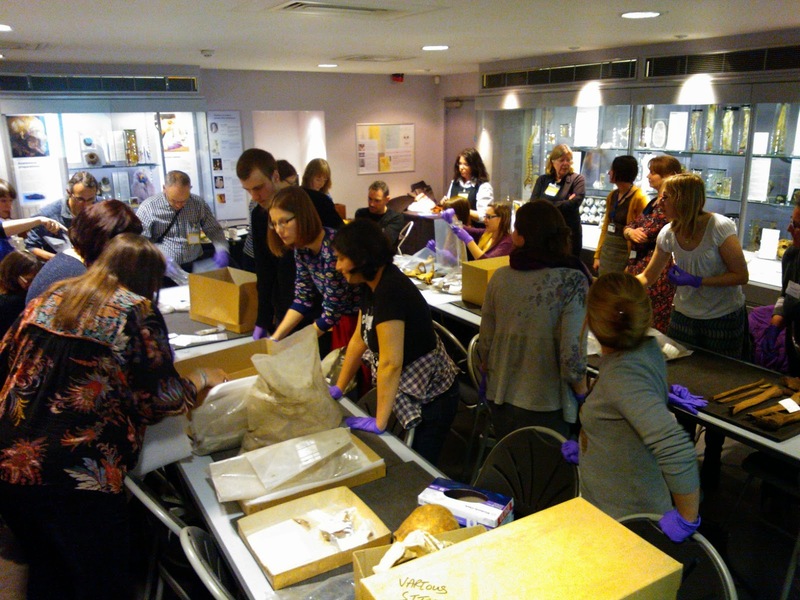 More than 30 curators, conservators, archaeologists and others came together in the appropriate environment of the Hunterian Museum at the Royal College of Surgeons (RCS) for a workshop on curating human remains in UK museums. The session was organised by the Human Remains Subject Specialist Network (SSN) in partnership with the Museum Ethnographers Group. Contributors included some of the most experienced and specialist practitioners in the field. The first two presentations, led by Margaret Clegg from the Human Remains Unit at the Natural History Museum (NHM) and Myra Giesen from Newcastle University, provided a useful introduction to the ethical and legislative framework surrounding the curation of remains. Myra, in discussing the Human Tissue Act and 2005 DCMS‘Guidance’ document and drawing on her experience of advising North American museums in NAGPRA compliance, had one key message: ‘Read the Law!’. Heather Bonney (NHM) and Carina Phillips (RCS) talked about the challenges of collections management and documentation regarding human remains in their respective institutions. In the afternoon conservator Chris Collins (NHM) outlined the general principles of conservation regarding human remains (respect; minimal intervention; acknowledgement of stakeholder wishes) before discussing a fascinating project the NHM had been involved in. Working for the Rwandan government, NHM conservators provided technical assistance to the process of creating several memorials dedicated to victims of the 1994 genocide, which included the remains of some of these. The session was a useful reminder of the vulnerability of human remains to political interest and of how ‘local’ interests concerning remains may differ significantly from any ‘national’ agenda. Following Chris, Gill Comerford (NHM) talked about best practice storage techniques and materials. While she acknowledged the greater resources that the NHM can command in this respect than most other museums, there was much interest amongst participants in the conservation-grade materials and packaging used. The final session was a practical session led by Rebecca Redfern and Jelena Bekvalac (both Museum of London) which gave participants a chance to appropriately repack archaeological human remains. The workshop drew participants from a wide range of disciplines. The fact that places filled so quickly – as did a waiting list – evidences a sectoral need and interest in building confidence in curating human remains. After a period of relative inactivity, the Human Remains SSN is now engaged in drawing up a constitution so that it can offer a more regular programme of events and activity. In the meantime its organisers are keen to support UK museum staff working with human remains in whatever way they can. Contact details can be found on the SSN website as, shortly, will copies of presentations given on the day. For the first time in a generation a large piece of barkcloth from MAA's collection will be on display in Cambridge. 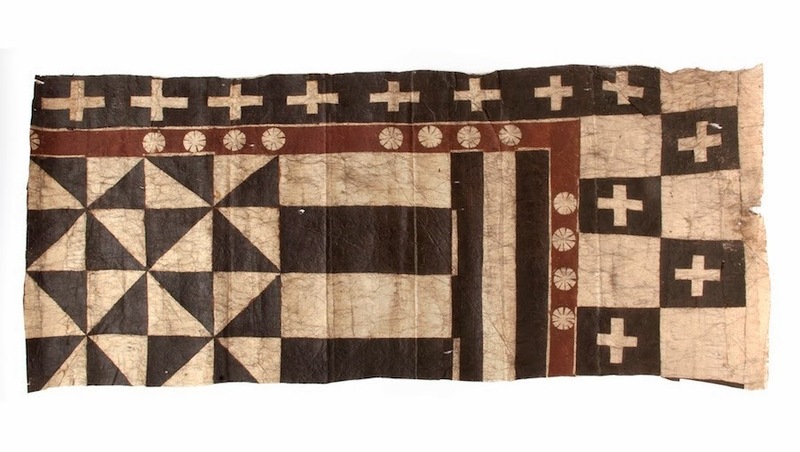 Nearly 15 metres in length, this barkcloth was part of a presentation by the Tui Cakau to Sir Arthur Gordon (the first British Governor of Fiji), as part of the conclusion of the Great Council of Chiefs Meeting on 12 December 1876. See the barkcloth and take part in drop-in family activities to explore the patterns. In association with MAA's exhibition "Chiefs and Governors: Art and Power in Fiji". On March 25th 2014 the Cambridge based ERC funded project Pacific Presences will hold its first conference, marking one year of the project. To book visit the website. The major international conference ‘Pacific Presences: Oceanic Art and European Museums’ investigates the art and history of the Pacific, and Europe's engagement with Oceania, through the rich ethnographic collections found in many European museums. Speakers include: Anita Herle (Museum of Archaeology and Anthropology, University of Cambridge), Edvard Hviding (University of Bergen), Jonathan Mane-Wheoki (University of Auckland), Sean Mallon (Museum of New Zealand Te Papa Tongarewa), Faustina Rehuher-Marugg (Belau National Museum), Megan Tamati-Quennell (Museum of New Zealand Te Papa Tongarewa) and Nicholas Thomas (Museum of Archaeology and Anthropology, University of Cambridge). A rare opportunity for a very close encounter with the outstanding breastplate that once adorned Tanoa Visawaqa, a powerful Fijian chief in the mid-nineteenth century. 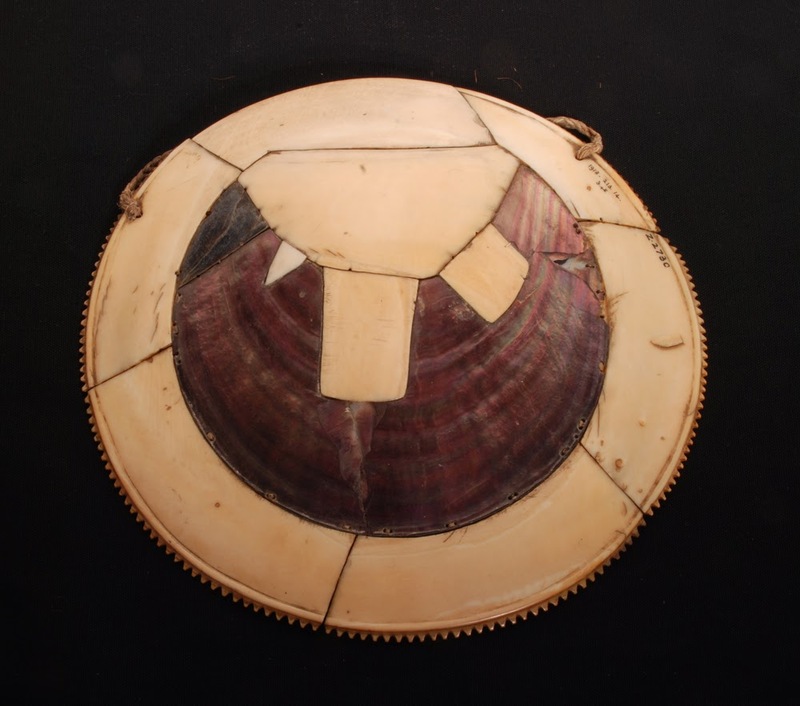 This workshop combines insights from recent historical research and conservation analysis to explore the movement of people, objects and skills within Western Polynesia. The event will include a gallery talk by the Curators of MAA's current exhibition "Chiefs & Governors: Art and Power in Fiji". £20 (£16 concessions). Booking essential. Please contact Liz Haslemere at the museum to reserve your place. An outcome of the AHRC Fijian Art Research Project (2011-2014). Never question the commitment of MEG members to participation in MEG events! Back in early December, the attempt of two MEG committee members to get to the Världskultururmuseet in Gothenburg for a MEG event involved a flight to Gothenburg diverted to Stockholm due to high winds and heavy snow then a grueling 14-hour overnight coach journey, much of it spend static in snow. 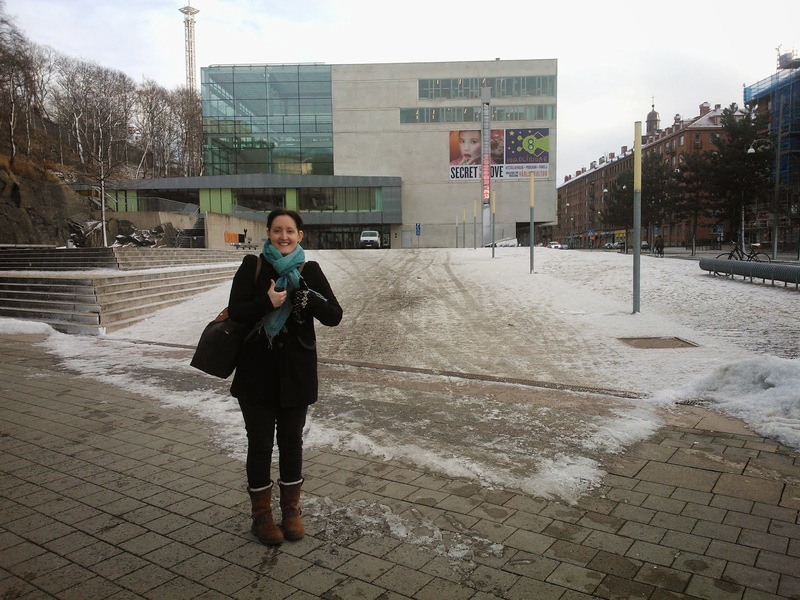 The beautiful Christmassy scenery and fascinating museum almost made up for it. Gothenburg's Världskultururmuseet opened in 2004 and is very much a product of its time. It chose to focus on 'issues' rather than objects and orientated itself towards a young adult audience, not only through its displays but also though a vibrant events programme which has included regular club nights. To the envy of other European museums the Världskultururmuseet has been phenomenally successful in attracting a younger audience and over 60% of its visitors are aged under 30. It also eschewed traditional, 'permanent' displays of objects for a changing series of often provocative exhibitions and displays, more than 40 of which have been on offer in the intervening period. Displays have dealt with sensitive 'global' issues including the spread and impact of HIV, the trafficking of people and -in the exhibition on at the time of MEG's visit Secret Love: Taboo Love in China - homosexuality in China. But what MEG's recent visit revealed is that, nearly ten years on, the Världskultururmuseet is experiencing something of a 'material turn'. Following the closure of Secret Love work begins on creating a large area of visible storage on the ground floor. While this will be visibly rather than physically accessible to the casual museum visitor, the museum's curator of contemporary global issues, Klas Grinell, noted that it will be a clear signifier that the collections form the foundation of the institution. This is a clear step away from the more issues-based approach taken in the past, in which objects were used to illustrate narratives of social/global concern, towards a more object-centered approach. This object-centered approach will also be explored through a semi-permanent series of installations which, it is proposed, will make evident some of the key object stories contained in the collections. Some of the ideas around how audiences may be invited to engage in these are currently being tested in a highly interactive and experimental Provrum ('dressing room') display section. Klas also noted a change of emphasis in audience, from young adults to young children and their families, in line with shifting government policy. A whole floor of the museum will be dedicated to this audience, with displays organised under the theme of 'Experiencing together'. The focus on attracting younger children also has an economic dimension, the theory being that children of this age invariably come with (paying) parents, grandparents or carers. 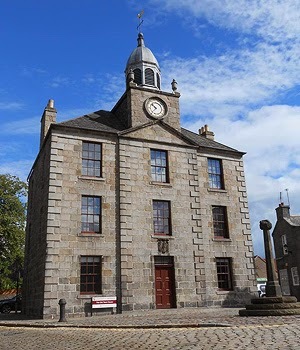 Entry to the museum was free on opening but now incurs an admission fee although free admission remains in place for the under-19s. Clearly the economic landscape inhabited by the museum has changed significantly since 2004. In contrast to UK equivalents, the Världskultururmuseet is almost entirely state-funded, however the initial governmental enthusiasm for its programmes, which attracted a budget of £2.5 million when the museum opened, has had to be revised and the budget has fallen by 90%. It has been a period of extraordinary change for the museum, which has had seven directors in nine years, and it is evident that this period of turbulence has yet to run its course. 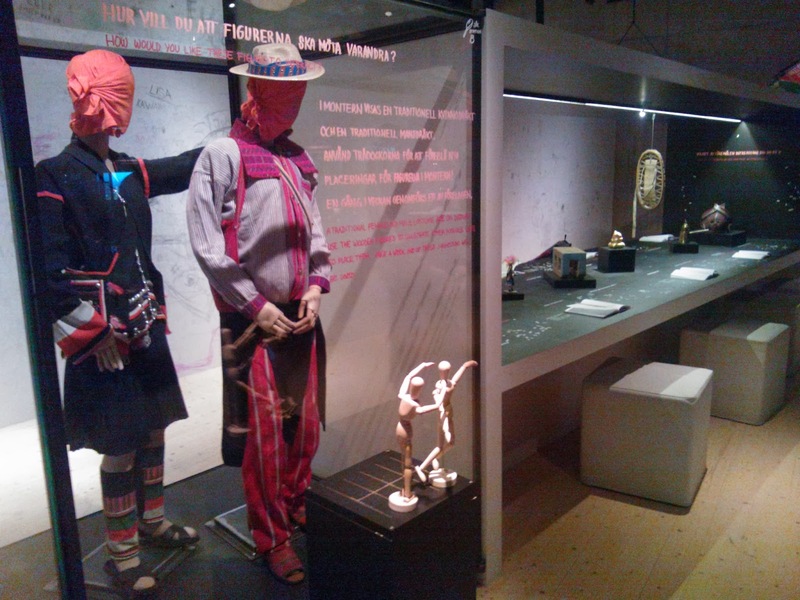 However, as a museum using ethnographic collections to enable new audiences to engage with changing global realities in new and radical ways there is much that those of us working with similar collections can learn from the Gothenburg example, not least its willingness to change and reinvent itself to ensure relevancy. We await the outcomes of its current transformations with interest. We hope that many of you can join us in Aberdeen for this year’s conference. We have many excellent speakers and are looking forward to a thought provoking and stimulating few days exploring and addressing the theme of collections, collaboration and communities. Museums now embrace opportunities to work with a range of communities and to develop a variety of partnerships. Recent research has also re-conceptualised the relationships between objects and between objects and people. This conference will explore how museum collections can inspire and benefit from a range of collaborations, and the opportunities brought by different disciplinary perspectives. As well as these formal elements, the conference is an excellent opportunity for networking, or as we like to think of it, making new friends and catching up with old ones. There will therefore be a conference dinner and as we are in Scotland a traditional ceilidh to enjoy. There will also be the opportunity to visit the exhibition ‘Fiji, Scotland and the making of Empire’ in King’s Museum. The programme is in the stages of being finalised. For more information, to keep up-to-date and to register for the conference, please visit the University of Aberdeen conference page. The British Museum is currently recruiting for a Project Curator to support the Indigenous Australia exhibition project team, working closely with the Lead Curator, Project Manager and other members of the team in the development and delivery of the exhibition and publications. The successful candidate will assist the Lead Curator as well as liaising with key internal and external stakeholders. The exhibition is being developed in tandem with the National Museum of Australia (NMA), and maintaining a good relationship with NMA staff is a key deliverable. You will obtain necessary information on loans (dimensions, special condition requirements, credit lines and copyright) through liaising with lenders and international and departmental loans officers. You will maintain a digital database with object list and images and track and monitor the movement of BM objects for the exhibition between departments. You will assist the Lead Curator with background research, drafting text, picture research and picture acquisition for the exhibition and related publications, and coordinate new photography and manage photographic orders. You will assist with obtaining copyright and rights of reproduction for images to be used in the exhibition, website and all related printed materials. You will assist the Lead Curator with the planning of a related programme of events, including: public lectures, providing gallery tours and other related public programming activities. The Museum is looking for an individual who has a degree or equivalent in anthropology or related discipline who has Museum or research experience. You will be highly proficient at using MS Office software and will have experience of using museum databases. You will be adaptable and resourceful with the ability to assess priorities in order to meet deadlines and have strong communication skills. If you have any queries regarding this role, please email us at bm@penna.com or call 0845 601 1124. Please quote the job reference number in the subject line of any email and at the beginning of a call.